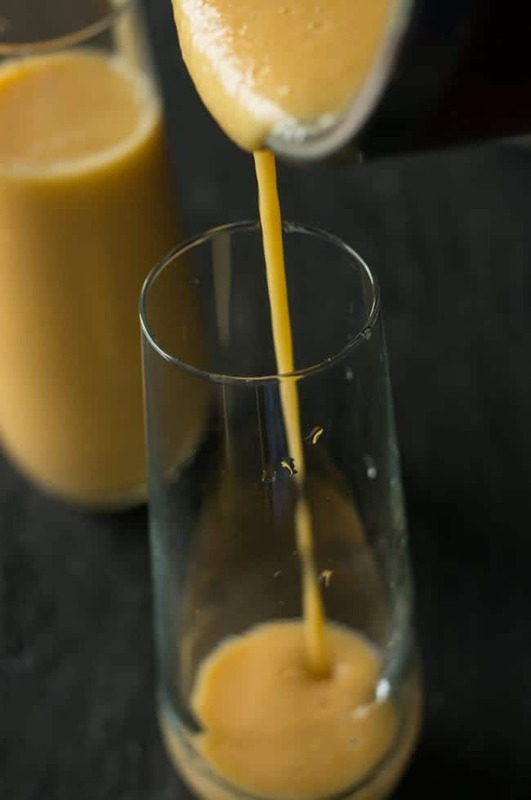 Ginger and coconut milk filled persimmon smoothie is the rich and healthy drink. Can transform into a satisfying breakfast or an excellent midday snack. This is a gluten free, dairy free, vegan refreshment suits for all ages. 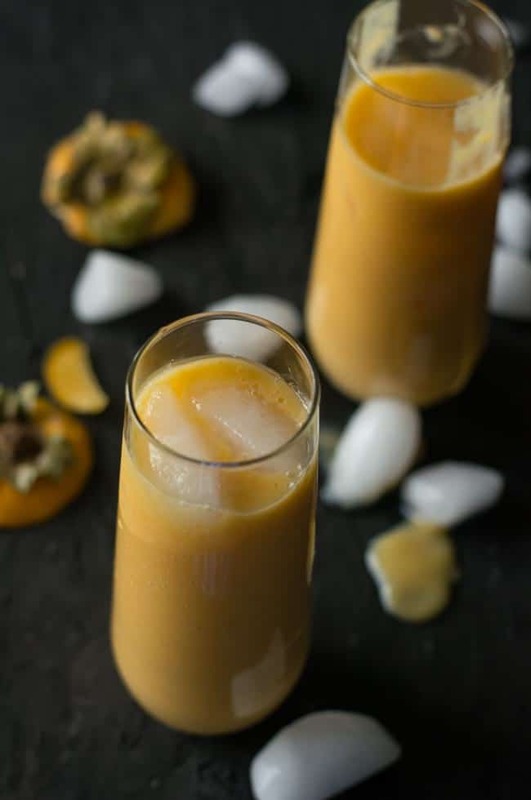 A fabulous, energy boosting persimmon smoothie is necessary to try in this fall. The robust blend of coconut milk, ginger and persimmon will satisfy everyone in the family. Furthermore, You will fall in love with this, even if you are not a smoothie lover. The success of boba smoothie initiated me to explore more into the smoothie world to get the best out of it. And this persimmon smoothie is one the find in my delectable search. If you are looking for other vegan breakfast recipes look into, Vegan avocado sandwich, coconut chia pudding. Persimmon is a delicious Japanese fruit also called Fuyu in Japan and this is Japan’s National fruit. 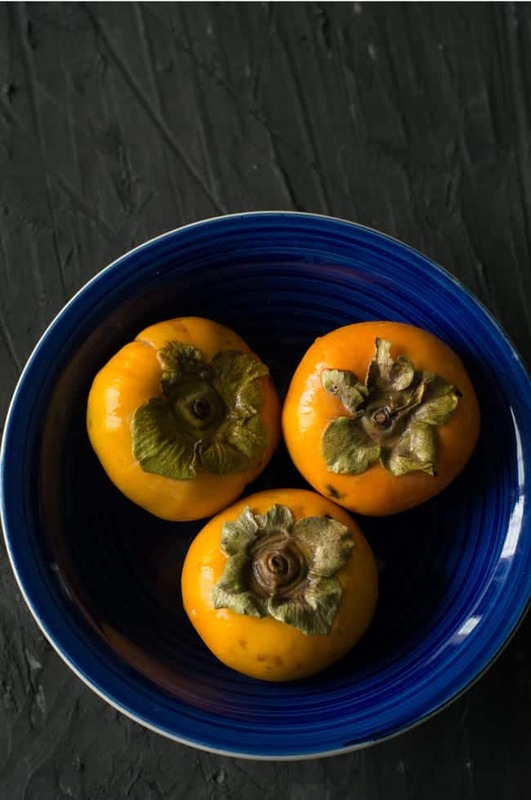 Persimmons are native to China, and it is in their culture for thousands of years. And introduced to the United States in the 18th century. And these are popular here in the United States as well. Though there are many varieties of persimmon available here, this fufu is common and most popular here. I’m seeing some of my neighbors are growing persimmon trees. And the trees look lovely and appealing when they have fruits hanging. They tempt me every time I happen to see them with loads of fruits. And this is one of the primary reasons for getting persimmon from the market and making the persimmon smoothie today. Imagine, how can I ever skip enjoying this fruit in this autumn season? This is luscious fruit mostly available in this fall season. It looks similar tomatoes with the with the bright orange color. This color and the skin perfectly matches the pumpkin, which is also another fall vegetable. It looks like tomatoes but has got a thicker skin. Which you need to peel it before using them. Though you can eat them as a whole, I would strongly recommend to peel off the skin when making the persimmon smoothie. As per healthline.com persimmons have a long list of health benefits. It is a good source of thiamin, riboflavin, folate, magnesium, phosphorus, and antioxidants. The top highlighting factor says this is a low-calorie fruit loaded with fibers, which is an excellent advantage for the people on weight loss goals. In addition to this, it is also great for digestion and the same applies to this persimmon smoothie. Most importantly, persimmon is easily customizable. You can snack them as raw, or include in your cooking or baking. You can use this parmesan fruit in any form. You do not need to wait for the fruit to get ripe, and it tastes great even if firm to touch. If you do not want to eat them as raw, or feeling lazy like me to eat. 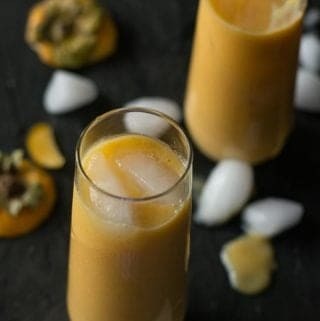 You can make this Persimmon smoothie, which turned out a nourishing, easy to make breakfast for me. This orange-colored persimmon a fruit has a thick skin. You can eat the fruit along with the skin, but the but the skin hard may not be suitable for making the smoothie. The flesh of this fruit is very sweet and no necessary to add any extra sugar. Or you may add natural sugar instead of regular sugar depending on your preference. The choices are numerous when talking about the liquid portion. You may add orange juice or water or yogurt or coconut milk or soy milk or almond milk. But I would not advise adding regular pasteurizer milk with the smoothie. As they are some chances cuddling when regular pasteurized the milk added. Instead, you may add yogurt to make persimmon smoothie. Today, I wanted to make this smoothie as vegan and more nutritious. And the coconut milk is the first choice as it has its medicinal benefits. Not only that, I have added coconut milk because I planned to have a nutritious and creamy smoothie. The creamy coconut milk and the persimmon combine better when they put it together. The fruit is naturally sweet, so might not need any external sugar added to the Smoothie. But you may add natural sweeteners like honey or refined sugar. I have added a teaspoon of sugar because I ran out of honey in my pantry. Persimmons do not have a strong flavor and the can I go perfectly with the any of the flavoring agents. I have added ginger to enhance the taste of the persimmon smoothie. Additionally, ginger is excellent for digestion and blends extremely wells with coconut milk. Ginger is one of my secret ingredient which I rely on, to instantly boosts the taste and the flavor of a dish. Chop the top and bottom of the fruit. Then peel the skin using the peeler. Then cut them into the half. Usually, the matured Persimmon has one stone seed. If they are tender, seeds will be tender as well. Proper care should be taken while cutting them into the half. If the fruit is tender, the knife slides into the fruit and vice versa. As I discuss to you earlier, persimmons do not have a strong flavor or taste. Hence it is great to bring together with any other flavoring ingredients. And thus, you have tons of choices for seasoning. Chia seeds to make it as a nutritious smoothie. Chopped nuts for not only for the texture but also wholesome. The preparation and making is simplest like any other smoothie recipe. Put all the ingredients together and pulse the blender for a couple of minutes until the smoothie reaches silky texture. Cut them into slices and remove the seeds. In a blender, add persimmon chunks, coconut milk, ginger, sugar. Blend it until it reaches a smooth and silky texture. Transfer them to tall serving glasses. Add ice cubes if you prefer. If the smoothie is too thick, then you may dilute it with water. The persimmon here, is one of those misunderstood fruits. Only recently having appeared in our markets, many people don’t understand the wonders of this fruit. 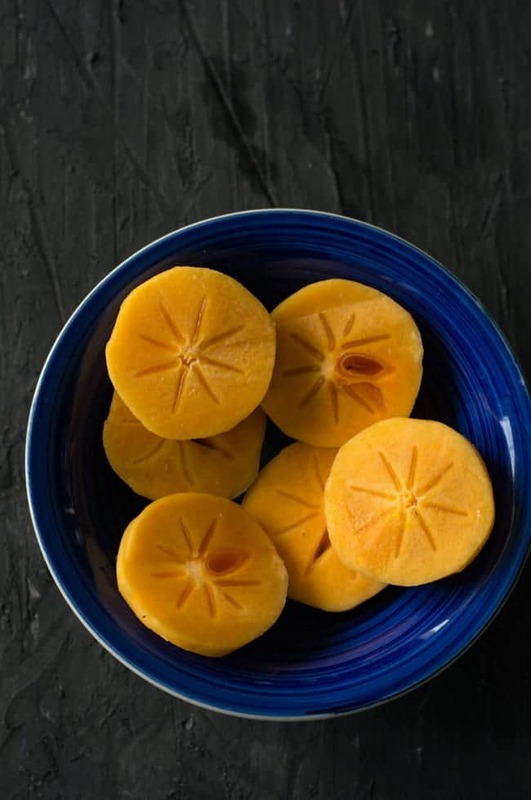 Having traveled in China for many years, I’ve eaten many persimmons and enjoyed their wonderful sweetness. However, I’ve never had one in a smoothie. Great idea. Ron, glad to hear these from an extensive traveler like you. Thanks.